: The custom lookup i set only lasts for a single poll of the sensors. Once they poll, they remove the lookup value settings and continue returning the values again? Can anyone help with this? Or know of an easier way of accomplishing this? I have addressed your questions below. However, first allow me to point out that I find it extremely unusual that the vendor implemented a MIB that returns both numerical/integer values and hexadecimal-encoded values (strings) in the same OID. Maybe it's just an issue with the MIB documentation. This would make more sense. I wasn't able to reproduce this with PRTG Version 18.2.41.1652 using your lookup file. Please make sure that you're running this version and that the issue persists. As soon as a value outside the lookup range arrives, I get the expected error. 2.: The custom lookup i set only lasts for a single poll of the sensors. Once they poll, they remove the lookup value settings and continue returning the values again? 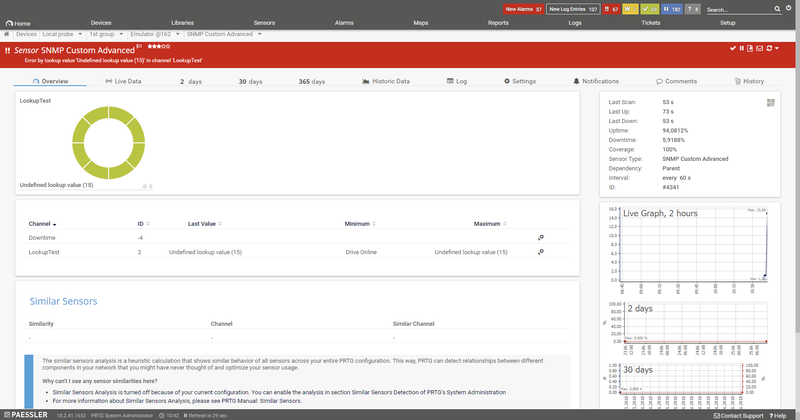 Please note that when working with Advanced (SNMP Custom Table, SNMP Custom Advanced, SQL V2, ...) sensors you need to configure the lookup in the Sensor Settings and not in the channel settings. Otherwise it gets overwriten on every interval. Edit:: I've tested this out with a "0x11" response within an ASN_OCTET_STR, and PRTG was able to decode it as 17. This is a new feature, and may not work in older versions. But this means that you could enter the corresponding decimal values in the lookup and PRTG will able to display the hexadecimal-encoded values (and corresponding statuses) as well. Yes, it is strange i know, which is why im having to go about the monitoring of the drives this way. Haven't had the need for the custom lookups until now! Thanks for that! Okay so, i was configuring the Value Lookup in the channel settings not in the sensor! Ive configured the lookup in the sensor and everything works. In regards to the edit, can i ask how you tested this? I can see the strings are returning values to prtg (0xfe - Missing Drive is returning value 63) and i would prefer to configure a lookup for each value. However im not sure how to test which error codes return which values, without somehow triggering an event of each? I've tested this with our internal device emulator. If you can confirm that this is working for you as well, simply add the missing lookups in your lookup-file. For instance, for 0xfe find the corresponding decimal value (for example, here). And that's all there is to it. After a "Load Lookups and File Lists", (Setup > Administrative Tools) the lookup should be able to translate the new stati as well. But indeed, you won't be able to test this unless the device indeed reports the status in question. But if it works for one, it should work for all. And worst case scenario, if the value can't be decoded (or gets decoded incorrectly) is that the sensor will go down because of the undefineState in the lookup. Ps. : I've checked with the responsible developer, and this unannounced feature (this hasn't been officially released yet) of decoding the incoming hex value is still being tweaked, so caution is advised when using this (for now). But since you have the undefineState in the lookup, you should be fine if something goes wrong. But should you observe any unexpected behavior, please let us know. Thanks for the help. I think i may have to wait until each state has occurred to create custom look-ups for them all. The hex converter i had already tried with 0xfe - which translates to 254 as you mention. However, PRTG translates sees this value as 63, so not sure how its translating.